Kday is coming for you! The countdown to Kday 2014 with MTN has started! - Article from newspaper, The Next 48hOURS. Jasmin Crook's Christmas Wish was finally fulfilled thanks to the Dischem Foundation! Meet the Tour de France winner at Charity event! 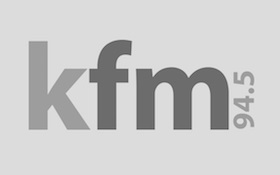 Kfm Breakfast's Ryan O'Connor talks about financial planning with Derick Ferreira from Old Mutual. The KFM Drive team is asking how long does it take you to get ready for a night out? The Kfm GP headed to Blue Rock to try out some wake boarding! Jeremy, Pags and the GP team tried their hand at busking, but with a special surprise for the audience! Meet Pete and Sarah Portal, a young couple with an exciting plan. This morning we had 3 listeners competing for a chance to "jump the queue" for the new season of Masterchef SA.